Trash-2-Cash was an EU funded research project which aimed to create new regenerated fibres from pre-consumer and post-consumer waste. It was also pioneering a whole new way of developing materials. One resource that’s becoming more abundant is waste. The idea of recycling textile waste has been popular for decades, but current mechanical methods give poor quality fabrics suitable only for industrial applications like insulation, and upcycling of pre-consumer textile waste into products is impossible to scale. 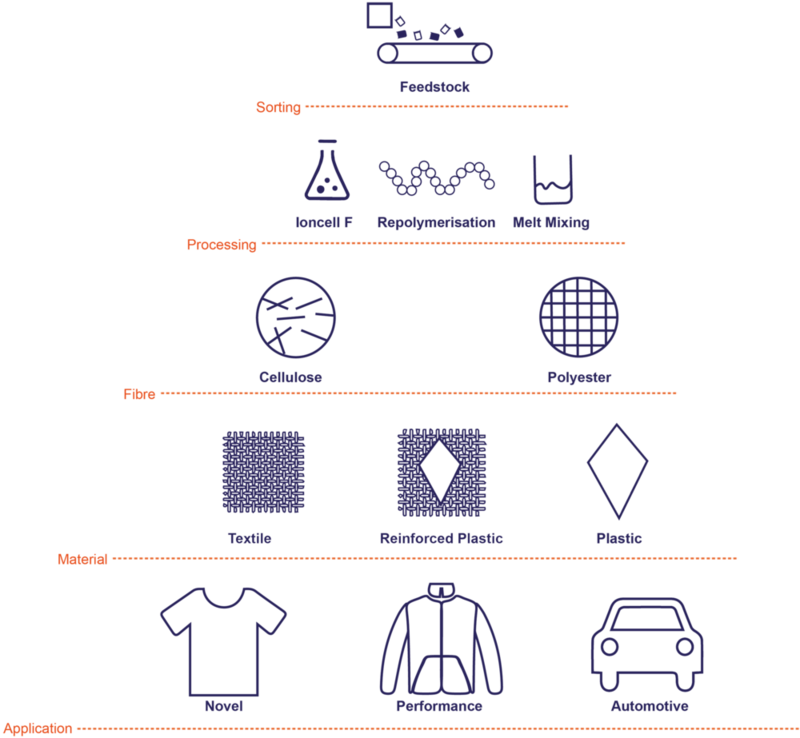 Trash-2-Cash (T2C) proposed a new model where paper and textile waste is recycled chemically - resulting in fabrics that are the same quality as new materials, to make products that are industrially replicable and infinitely recyclable. Who was part of this challenge? Designers, design researchers, scientists, raw material suppliers and product manufacturers from across Europe made up a cross-disciplinary consortium representing the whole product supply chain. Eighteen partners, from ten countries, were working together to address the challenge of designing high quality industrial materials from waste. This was a three-and-a-half-year project. The first phase was cross-sectoral, with the whole group designing a wish list of fibre properties, then describing a vision for how the novel recycled materials would be used. In the second phase, material scientists produced samples of the new recycled cellulosic and polyester materials, and designers and industry produced product prototypes, based on consumer insights. In the final phase, academics reflected on the new collaborative Design Driven Material Innovation (DDMI) methodology, drawing upon their observations from the entire project. T2C has achieved a high quality materials and product prototypes from waste, offering companies in various industries (fashion, interiors, automotive and other luxury goods) new eco-fibre options. We also hope to influence how all novel materials are developed in the future through DDMI methodology. This new way of working will outline how science, design and industry can input into the process from beginning to end.